Everitt, Texas, San Jacinto County. William Nyle Everitt moved into the area in the late 1880s and is credited with founding the town and serving as its first postmaster. A post office was granted in 1890 and the town increased the number of residents until it peaked at 300 during the early years of the 20th Century. The region was already suffering from the loss of lumbering jobs, when the Great Depression arrived, the population spiraled downward. The post office was shuttered in 1929 and it wasn't long until the town stopped appearing on maps. That may have been the end of the story until we heard from a descendant of the founding family. His letter is responsible for the inclusion of Everitt in our coverage. William Nyle Everitt was my great grandfather. He was born 2/12/1844-Washington County, Alabama. Died 10/4/1904 and buried Magnolia Cemetery, San Jacinto County, Texas. Son of Jehu Everitt, Jr and Mary Norsworthy Everitt. William Nyle Everitt married Isaphelia (Icy) Abragella Traweek 3/24/1863, Clarke County, Mississipi. She was the daughter of Robert Brown Traweek and Levicy Crum Traweek. Isaphelia was born 2/17/1844 Butler County, Alabama; died 5/18/1895 -buried Magnolia Cemetery, San Jacinto County, Texas. William Nyle and Isaphelia Everitt were the patriarch and matriarch of the San Jacinto County Everitt's. They came from Clarke County, Mississippi, by covered wagon in 1870 and settled in San Jacinto County the same year the county was created. 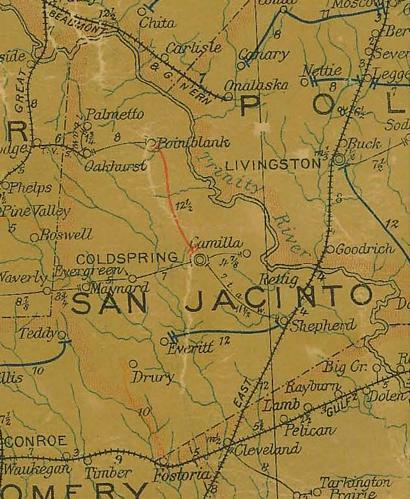 The area the Everitt's settled was named Everitt, Texas, and appeared on the Texas State maps unitl possibly the 1950's. This couple helped organize the Magnolia Baptist Church and became some of its original members and were members until their deaths. This church is still in existance and celebrates its annual homecoming each October. The Magnolia Cemetery is located by this church. Many, many descendents of William Nyle and Isaphelia Everitt are still residing in what was originally known as Everitt, Texas. - Dueane Richard Everitt (my grandfather) born5/16/1871 in Everitt, Texas; died 3/19/1950; buried in Magnolia Cemetery, San Jancinto County, Texas.